Is geared for ages 16+. This class is appropriate for someone with no (or little) experience in Taekwondo. 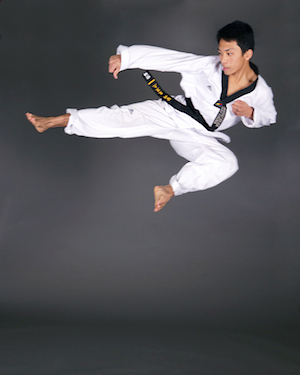 A class that focuses on the fundamental basics of Taekwondo through precise technical training. This class is great for anyone looking to learn Self-Defense, for stress relief, for weight loss or maintaining their good shape. This is a class where you could have a hectic day, leave it at the door, and train feeling alive and rejuvenated. The Adult Beginners Program is an interactive class where students will work together or alone but accomplish goals together. It is a social program and team work and respect for others is at the forefront of every lesson. Our Adult Beginners train hard, feel accomplished, and look forward to the next class. The greatest thing about the Adult Beginners program is that adults have one thing that children don’t. Body stability. Adults have officially grown into their bodies and do not expect developmental changes which allows them to really work from their core and strengthen their abilities. They are better able to understand body awareness both of themselves and of those around them. Adults are able to channel environmental awareness and use these skills to not become victims of crime. An adults outlook on themselves and their abilities start to make a shift towards a great and positive direction and there is nothing quite like feeling that surge of energy through your system motivating and driving you towards bigger and better things.